Back to the Yokohama Arena was a professional wrestling pay-per-view (PPV) event promoted by New Japan Pro-Wrestling (NJPW). The event took take place on May 25, 2014, at the Yokohama Arena in Yokohama, Kanagawa and marked NJPW's first event at the arena in eleven years. The event, considered one of NJPW's biggest of the year, following Wrestle Kingdom 8 in Tokyo Dome and the finals of the G1 Climax, featured four championship matches and was headlined by a match for the promotion's top title, the IWGP Heavyweight Championship. The event aired domestically as a regular PPV and internationally as an internet PPV. While the show was praised for its match quality, it was considered a disappointment due to poor attendance numbers. NJPW has not returned to the Yokohama Arena since. On November 6, 2013, Bushiroad, the owners of NJPW, announced a special project celebrating their seventh anniversary; a return to Yokohama Arena with the Back to the Yokohama Arena event on May 25, 2014. This would mark NJPW's first event at the arena since November 3, 2003, and the Yokohama Dead Out show. The entire card for the event was released on May 4, the day after Wrestling Dontaku 2014. 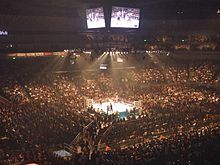 Back to the Yokohama Arena featured ten professional wrestling matches involving different wrestlers from pre-existing scripted feuds, plots, and storylines. Wrestlers portrayed villains or heroes as they followed a series of events that built tension, and culminated in a wrestling match or series of matches. Four of the matches were contested for championships. Back to the Yokohama Arena was the final event before the start of the 2014 Best of the Super Juniors tournament and as part of the build-up to it, the opening match of the show featured eight participants in a multi-man tag team match. The first title match would feature Tencozy (Hiroyoshi Tenzan and Satoshi Kojima) defending the NWA World Tag Team Championship against former champions, K.E.S. (Davey Boy Smith Jr. and Lance Archer), and representatives of the National Wrestling Alliance (NWA) Rob Conway and Wes Brisco in a three-way match. Conway, who is also a former NWA World Tag Team Champion alongside Jax Dane, had made sporadic appearances for NJPW since Invasion Attack in April 2013, while Brisco made his debut for the promotion at Wrestling Dontaku 2014. The villainous NWA side, led by president Bruce Tharpe, had been involved in a storyline rivalry with Tencozy and especially Satoshi Kojima ever since Invasion Attack. During the first half of 2014, both Conway and Brisco had unsuccessfully challenged Kojima for his NWA World Heavyweight Championship. The second title match would see Tomohiro Ishii defend the NEVER Openweight Championship against IWGP Junior Heavyweight Champion Kota Ibushi as part of a rivalry that dated back to previous August's G1 Climax. Also on the card was a tag team match between the teams of Meiyu Tag (Hirooki Goto and Katsuyori Shibata) and Ace to King (Hiroshi Tanahashi and Togi Makabe). On May 5 at Wrestling Dontaku 2014, both teams asserted themselves as the next challengers for Bullet Club's (Doc Gallows and Karl Anderson) IWGP Tag Team Championship, which led to this match, where the winner will be getting the next title shot. In the build-up to the match it was insinuated that there were problems between Goto and Shibata due to Shibata showing more interest in settling a grudge with Tanahashi than another shot at the IWGP Tag Team Championship. During the event mixed martial artists Daniel and Rolles Gracie would be working their first singles matches in NJPW. Since starting with the promotion in January 2014, the Gracies had worked only tag team matches and have taken advantage of the "ishu kakutōgi sen" rules of their matches, which had allowed them to use their gis to choke their opponents and secure submission victories. Ever since their debuts for the promotion, the Gracies had feuded with Kazushi Sakuraba, who gained fame in the MMA circles as "The Gracie Hunter" for his victories over members of the Gracie family. However, in NJPW the Gracies had dominated Sakuraba, with Rolles twice submitting him with a gi choke. In the second of the losses, Sakuraba teamed with Shinsuke Nakamura, who also had a history with the Gracies, losing to Daniel in a legitimate MMA fight in December 2002. Following the match at Wrestling Dontaku 2014, Daniel challenged Nakamura to a match for his IWGP Intercontinental Championship, leading to Back to the Yokohama Arena, where the title match, along with a singles grudge match between Sakuraba and Rolles, was set to take place. Both matches were worked under "ishu kakutōgi sen" rules, but were scripted professional wrestling matches and not legitimate MMA fights. Wrestling Dontaku 2014 marked a rebirth for the villainous Bullet Club stable, when Yujiro Takahashi turned on the Chaos stable and joined Bullet Club by helping A.J. Styles defeat Kazuchika Okada for the IWGP Heavyweight Championship. The undercard of Back to the Yokohama Arena would feature Takahashi's first match as a member of Bullet Club, when he teamed with his new stablemates in an eight-man tag team match. The event also featured Bullet Club's Bad Luck Fale taking on Tetsuya Naito in a match, where NJPW suggested the winner could enter a singles title picture. The two previously faced off in the second round of March's New Japan Cup, where Fale was victorious. In the main event of the show, Okada would receive his rematch for the IWGP Heavyweight Championship. His opponent would be the winner of a title match between Styles and Michael Elgin at War of the Worlds, a NJPW and Ring of Honor (ROH) co-promoted event in New York City on May 17. Okada was eventually added to the match, making it a three-way. Styles, however, retained his title by pinning Elgin, making the match between him and Okada official for Back to the Yokohama Arena. In the first title match of the event, Tencozy made their second successful defense of the NWA World Tag Team Championship in a three-way match with Tenzan pinning Brisco for the win. Post-match, K.E.S., having not been involved in the finish, challenged Tencozy to a future title match. The next match featured a major storyline development in the long storyline rivalry between Minoru Suzuki and Toru Yano. Before the match started, Lance Archer blocked referee Tiger Hattori's view of the ring, while Yano's Chaos stablemate and tag team partner Takashi Iizuka, with whom he had held both the IWGP and GHC Tag Team Championships, turned on him, hitting him with his signature iron claws. Archer then released Hattori to start the match and count a quick pinfall win for Suzuki over Yano. Post-match, Iizuka put on a shirt of Suzuki's Suzuki-gun stable. In the second title match of the event, Tomohiro Ishii made his fourth successful defense of the NEVER Openweight Championship against IWGP Junior Heavyweight Champion Kota Ibushi. After the match, Ishii was attacked by his former Chaos stablemate Yujiro Takahashi, who set himself up as his next challenger. In the next match, Hiroshi Tanahashi and Togi Makabe defeated Hirooki Goto and Katsuyori Shibata to become the number one contenders to the IWGP Tag Team Championship. The win was a result of miscommunication between Goto and Shibata, continuing the storyline dissension between the two. During the match, Makabe suffered a legitimate mandibular fracture, which forced him to miss the next couple of events. The singles match debuts of both Daniel and Rolles Gracie ended in losses for the Brazilians. Rolles was defeated by Kazushi Sakuraba via technical submission, while Daniel was pinned by Shinsuke Nakamura, who in the process made his first successful defense of the IWGP Intercontinental Championship. Post-match, Nakamura was challenged by Bad Luck Fale, who earlier in the event had defeated Tetsuya Naito. In the main event of the evening, A.J. Styles made his second successful defense of the IWGP Heavyweight Championship against previous champion Kazuchika Okada. The match featured outside interference from both Bullet Club and Okada's Chaos stablemate Tomohiro Ishii, who entered the ring to avenge Takahashi's earlier attack on him. Dave Meltzer of the Wrestling Observer Newsletter wrote that the show had a "very different feel from the company's recent major shows" due to the disappointing attendance number, which he blamed on poor matchmaking and an oversaturated market. Meltzer wrote that while A.J. Styles had the talent, it was too early for him to be a main event draw and that Japanese fans had not accepted him as the "real world champion". Regarding the matches at Back to the Yokohama Arena, Meltzer gave the highest ratings of four and three quarter stars out of five to the NEVER Openweight Championship match and four and a half stars to the main event. Meltzer gave the lowest rating of one and a half stars to the Intercontinental Championship match, while also criticizing the entire Gracie storyline, which culminated at Back to the Yokohama Arena, writing that it "didn't connect with anyone". ^ a b c d e f g h i j k l "Back to the Yokohama Arena". New Japan Pro-Wrestling (in Japanese). Retrieved May 25, 2014. ^ Meltzer, Dave (May 5, 2014). "May 5, 2013 Wrestling Observer Newsletter: Kenta update, his future, TNA's issues with creative, TV situation, UFC 172, tons more". Wrestling Observer Newsletter. Campbell, California. p. 26. ISSN 1083-9593. ^ Meltzer, Dave (July 13, 2015). "July 13, 2015 Wrestling Observer Newsletter: Dusty Rhodes bio part 2, back to back major shows in Japan, & more". Wrestling Observer Newsletter. Campbell, California. p. 17. ISSN 1083-9593. ^ "【写真追加!!】来年5月25日（日）、新日本プロレスの横浜アリーナ大会が11年ぶり復活!! 『Back to the Yokohama Arena』!!". New Japan Pro-Wrestling (in Japanese). November 7, 2013. Retrieved May 4, 2014. ^ 新日が来年５月２５日に横浜アリーナ大会. Tokyo Sports (in Japanese). November 7, 2013. Retrieved May 4, 2014. ^ 新日、来年５・25に11年ぶり横アリ. Nikkan Sports (in Japanese). November 7, 2013. Retrieved May 4, 2014. ^ a b c d e f g h i j "5.25（日）横浜アリーナ全カードが決定! NY大会勝者にオカダが挑戦! 中邑vsダニエル! 棚橋＆真壁vs後藤＆柴田! 石井vs飯伏!". New Japan Pro-Wrestling (in Japanese). May 4, 2014. Retrieved May 4, 2014. ^ a b Caldwell, James (May 4, 2014). "NJPW news: Big line-up announced for May 25 with ROH implications, plus full Super Jrs. tournament field". Pro Wrestling Torch. Retrieved May 4, 2014. ^ ロブ・コンウェイ. New Japan Pro-Wrestling (in Japanese). Retrieved May 4, 2014. ^ a b c d レスリングどんたく 2014. New Japan Pro-Wrestling (in Japanese). Archived from the original on May 8, 2014. Retrieved May 4, 2014. ^ Caldwell, James (January 4, 2014). "Caldwell's NJPW Tokyo Dome results 1/4: Complete "virtual-time" coverage of New Japan's biggest show of the year - four title changes, former WWE/TNA stars featured, more". Pro Wrestling Torch. Retrieved May 4, 2014. ^ Caldwell, James (April 13, 2014). "NWA news: New Japan star to defend NWA Title in the U.S." Pro Wrestling Torch. Retrieved May 4, 2014. ^ 同級生タッグに亀裂！？ 柴田が洋央紀に不信感. Tokyo Sports (in Japanese). May 2, 2014. Retrieved May 25, 2014. ^ a b "The New Beginning in Osaka". New Japan Pro-Wrestling (in Japanese). Retrieved May 4, 2014. ^ Meltzer, Dave (May 8, 2007). "Gracie vs. Sakuraba official". Wrestling Observer Newsletter. Archived from the original on May 4, 2014. Retrieved May 4, 2014. ^ "Shinsuke Nakamura". Sherdog. Retrieved May 4, 2014. ^ Namako, Jadon (March 22, 2014). "3/22 NJPW iPPV Results: Nagoya, Japan (Cup 2nd Round)". Wrestleview. Retrieved May 8, 2014. ^ "ROH＆新日本プロレス「War of the Worlds」". New Japan Pro-Wrestling (in Japanese). Retrieved May 17, 2014. ^ a b c d e f g Caldwell, James (May 25, 2014). "Caldwell's NJPW iPPV results 5/25: Complete "virtual-time" coverage of live show featuring Styles vs. Okada for IWGP World Title, MOTY Contender, NWA Tag Titles, more". Pro Wrestling Torch. Retrieved May 25, 2014. ^ a b c d e f g "新日本プロレス「Back to the Yokohama Arena」". Sports Navi (in Japanese). Yahoo!. May 25, 2014. Archived from the original on May 25, 2014. Retrieved May 25, 2014. ^ 骨折の真壁６月大阪大会は支障なし. Nikkan Sports (in Japanese). May 27, 2014. Retrieved May 29, 2014. ^ Meltzer, Dave (June 2, 2014). "June 2, 2014 Wrestling Observer Newsletter: Latest on Daniel Bryan and the title, Silva vs. Sonnen off, Dillashaw ends another streak, Chikara, New Japan and more!". Wrestling Observer Newsletter. Campbell, California. pp. 4–6. ISSN 1083-9593.